Chinese people believe that Japanese soldiers committed many crimes in Nanking city, China in 1937. The Chinese anti-Japanese education policy is being implemented to school kids in China, so teachers teach wrong historical issue, such as Nanking Massacre, to school kids with fabricated pictures and videos. This is a Government strategy to lead people will be controlled by it. Why China has to do such an act? The answer is here. Teachers have taught anti-Japanese sentiment using the Nanking Massacre to schoolkids. Some historians and politicians have found the answers why China needs the anti-Japanese policy, and what the purpose of that is. Here are these reasons. The first reasons of starting the anti-Japanese policy was for hiding Tibet and Uighur human right problems in China from people. The second reason is the Chinese government is afraid of occurring the 2nd Tiananmen Massacre. Finally, Chinese government fears some districts will be independent from China. While Chinese people are cursing and swearing Japan, Chinese government is safe. Look at Chinese people, who took part in an anti Japanese demonstration, don't you feel something strange? Think about the Nanking Massacre which had been insisted on its happening more than seventy years ago, but this is not even clearly defined. They haven’t learned right history in China. They are victims of dictator country. In war story, acts of abominable cruelty happened in every county. The My Lai Massacre was the mass murder conducted by a unit of the U.S. Army on March 16, 1968 of 347 to 504 unarmed citizens in South Vietnam, all of whom were civilians and a majority of whom were women, children (including babies) and elderly people. Lai Daihan are people born to a South Korean father and a Vietnamese mother during the Vietnam War.As for China, the 228 Massacre was an anti-government uprising in Taiwan that began on February 27, 1947, and was violently suppressed by the Kuomintang (KMT) government. Estimates of the number of deaths vary from ten thousand to thirty thousand or more, and Tibet and Uygure problems are the same. Why is the CCP loudly denouncing the 'Nanking Massacre' when then had insisted on it happening more than seventy years ago, but it is not even clearly defined? Chinese government has a reason why they need a Japanese atrocity in China. The fundamental reason for that is the Chinese Communist Party became the core power that united the nation. For getting the core power, the government has taught anti-Japanese education to school kids, and tried to band Chinese people together strongly. “China's Textbooks Twist and Omit History.“ By Howard W. French. New York Times on December 5, 2004. Most Chinese students finish high school convinced that their country has fought wars only in self-defense, never aggressively or in conquest, despite the People's Liberation Army's invasion of Tibet in 1950 and the ill-fated war with Vietnam in 1979, to take two examples. Similarly, many believe that Japan was defeated largely as a result of Chinese resistance, not by the United States. According the NYT, a teacher said a blistering pace, during a lecture on China's relations with the world from 1929 to 1939 in one of this country's, Japan decided to pursue its own longtime desire for a continental empire, and attacked China. I heard teachers have used 1937 pictures which showed the fake of Nanking Massacre.That’s why what Chinese people in youtube say is so one-sided. Chinese government has taught wrong history to school kids. The fundamental reason for that is the Chinese Communist Party became the core power that united the nation. For these reasons, no one learns that 30 million people died from famine because of catastrophic decisions made in the 1950's, during the Great Leap Forward, by the founder of Communist China, Mao Zedong and the 1989 protests in Tiananmen Square. Can we call this mind controlled? I think YES! Japanese people don't learn a historical fact of Pearl Harbor? 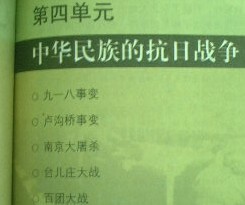 100% of Japanese people would answer they have learned the fact except some people who has not gone to schools seriously.I know Chinese people believe Japanese text books have not been written some of the horrors of its 1941-45 war record such as the Pearl Harbor because the Chinese government has announced the wrong fact. This fact shows Chinese governmnet has brainwashed the Chinese children. You should show me which part of Japanese text books are distorted by Japanese government? Do you know how many Japanese text books are published after many historians checked them? On the other hand, Chinese history books are checked by Communists. In short school books are approved by the central government. As a result, many Chinese people believe that Japan was defeated largely as a result of the Chinese resistance, not by the United States for praise China. Moreover, the Chinese students don't learn much either about the great upheaval in China, the events in Tiananmen Square, in 1989. How can you excuse this fact? You should show me which part of Japanese text books are distorted by Japanese government?